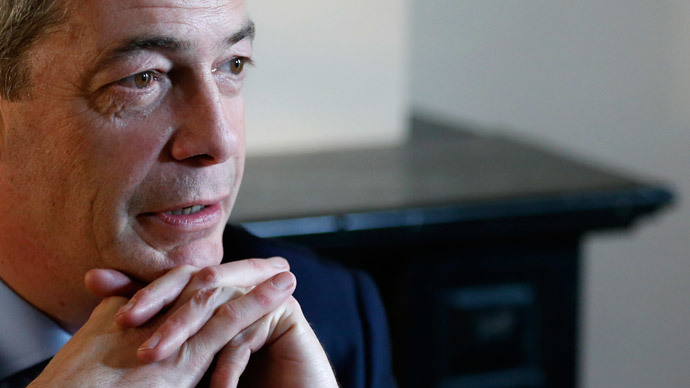 Leader of the UK Independence Party (UKIP) Nigel Farage has said the single biggest fear for the Conservative and Labour Parties is an increased number of UKIP MPs in Parliament after May’s general election. In a column for the Telegraph, Farage called the current election campaigns from both parties “dull” and “predictable,” saying his party campaign and manifesto had far more broad-reaching public support than either Labour or the Conservatives. The UKIP leader went on to slate the campaigns of both parties, saying they were too focused on their traditional areas of support. “Labour is trying to claim our National Health Service as if they own it. The Tories are trying to grab at the economy, as if they haven’t presided over a doubling of the national debt in just five years, and failing to erase the deficit. Pretty predictable stuff,” he said. He said UKIP focuses on policies which have appeal throughout the country, such as leaving the EU, scrapping tax for minimum wage earners and abolishing tuition fees for those studying mathematics and sciences. Farage suggested Labour and the Conservatives had turned their parties from ones with national support into region-specific parties, saying UKIP was the only one with nationwide support. He said Labour was becoming increasingly northern-centric, with the Conservatives mainly garnering support in the south. “UKIP, on the other hand, is doing as well in the North as we are in the South. We’re a party that represents the whole country and, even more importantly, we have broken the class divide in British politics,” he added. His comments, however, are met with the latest polling figures, which suggest a small drop in Nigel Farage’s support could be worth up to 20 seats in parliament once the votes are counted. Should UKIP’s support wane in the coming months, the extra seats could ensure the Conservatives are the largest party overall and give Cameron the chance to form a coalition government. It would also remove the Scottish National Party (SNP) from any further post-election Westminster negotiations. Current analysis from the Guardian puts the Conservatives on 272 seats, which is short of an over majority of 326, but marginally higher than Labour at 270. Should UKIP support drop, this could bring the Conservatives up to 290, giving Cameron, with the support of the Liberal Democrats and Democratic Unionists, enough room to remain Prime Minister. UKIP is currently polling at 15.5 percent. It is hard to gather accurate statistics, however, because there is a significant difference between various polls.